I must admit, before I got into blogging and reading other blogs my skincare routine was quite basic and consisted of using Simple's cleanser, toner and moisturiser just because it was what my mum bought at home so I kinda just stuck to that. Now I love reading about new and exciting products and brands that are just that wee bit more exciting. I'm sure a lot of you have heard of Nip + Fab and the great products they offer for your face down to your feet - I mean, even Kylie Jenner is a fan. They kindly sent me over a few products to try and I can say, they're probably the best skincare range I've used to date - and that's my honest opinion! I was given 5 products to try out - all to make my face radiant and fabulous. To make this easier I'll break this post down into what the five products are intended to do and what my thoughts were on each one. Bee Sting Fix Lifting Mask - "An advanced performance gel mask combining bee venom with 3D express lifting effect technology. Wrinkles appear visibly smoother + skin feels firmer for the appearance of a more lifted facial contour." 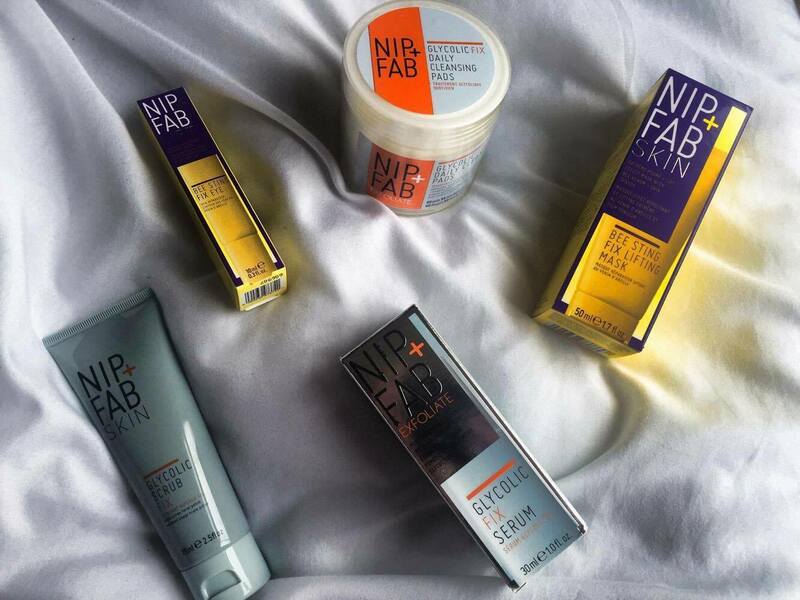 G: Firstly I love the packaging of nip + fab as a whole, and this stuff also smells great. It comes in a gel texture and I usually apply this 2-3 times a week and leave it overnight as an "intensive mask", because I don't have the patience to wait 10 minutes otherwise to rinse it off. It definitely leaves my skin feeling soft and radiant in the morning and I haven't even been wearing foundation because it feels too clean to ruin. Bee Sting Fix Eye - "A rich + stimulating eye cream to defend against the look of fatigue. Nip+Fab brings you Bee Venom which is the latest anti-ageing active for younger looking skin. This will target your eye area to brighten and reduce the look of tiredness." G: Like the lifting mask, this stuff also smells great. I can't quite put a scent to it but if it's got bee venom in it...maybe something to do with that. Just putting it on makes my eye area look more vibrant - I can't comment much on the wrinkles because I'm 21 and thankfully major ones haven't developed yet. I can say my eye area looks less puffy in the mornings. Glycolic Fix Daily Cleansing Pads - "Unveil younger-looking skin with our innovative Glycolic Fix. 60 radiance-boosting pads, soaked in exfoliating glycolic acid (2.8%) retexture + resurface skin whilst witch hazel helps to tone. This moisturising formula with hyaluronic acid + soothing blue daisy helps to reveal brighter + smoother looking skin." G: I used to use baby wipes to remove my make-up because frankly they do the same job as make-up wipes, but ever since I started using these pads I haven't turned back. They kind of smell alcoholic but that's due to the glycolic acid, they do leave your face feeling fresh and cleansed. Glycolic Fix Serum - "An innovative overnight serum with 4% glycolic acid to retexture the skin's appearance. This highly effective formula contains powerful glycolic acid to smooth the appearance of fine lines + wrinkles while improving skin texture. Designed with pore refining ingredient PoreAway, the size of pores are visibly reduced for a more refined, even looking complexion." G: I use this every night and wake up with baby soft skin - on application your skin will look a tad greasy so it's probably not the best thing to apply to your face if you're about to head out, for that some simple moisturiser will do. Glycolic Fix Serum - "Scrub your skin to perfection with a new breed of facial exfoliator, Glycolic Facial Scrub Fix. This 3-in-1 micro exfoliant is packed with 3% glycolic acid and salicylic acids to refine, brighten + renew. Glycolic Fix Facial scrub works deep into pores to cleanse, polish + reduce blemishes from the first use. With a fruity grapefruit scent, it energises + awakens the skin." G: I can honestly say I have this to thank (combined with the other products?) for a spot free face - for now. I had a breakout on my chin and they've all pretty much disappeared. I've also been wearing less make-up so that helps. But again I use this in the shower daily in the evenings and it's not too abrasive on the skin either. What skincare products have you been enjoying?